This one’s getting a big studio-scale release with lots of advance publicity. But don’t be put off by the brash posters pushing it as a comedy. Though Three and Out is often grimly funny, it’s as much a drama and, at times, deeply moving. The set-up is simple. Colm Meaney is Tommy, an Irishman in London who plans to kill himself. 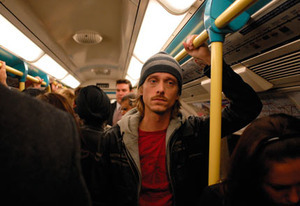 Mackenzie Crook is Paul, a tube driver who wants Tommy to jump in front of his train so he can get medically retired. They play it for real beautifully, but Imelda Staunton, as Rosemary, Tommy’s abandoned wife, takes things to another level. Rosemary’s plate-throwing wobbly, which could too easily be hackneyed, but is as convincing as you’ll see, shows her deep hurt and anger, and yet is funny too. Her scenes give you a profound sense of the pain that Tommy’s inflicted, but also of her love for him and her daughter. That’s at the heart of the film, which isn’t at all flippant. Gemma Arterton is very good as the daughter Tommy abandoned as a little girl. At times the direction is too obviously comic – the opening scene with the other train drivers, and a chase in a housecoat. The final recitation of Yeats is garbled and the last minute or so belong to a more conventional love story, shifting the focus away from what should be a very strong sting in the tail. Even so, it’s convincing because of its realism. This is top-notch and a too-rare thing – an intelligent British comedy drama.